The School Year is Starting, Take Your Kids for a Checkup! August 11th, 2017 by Sherman Oaks Dental | Comments Off on The School Year is Starting, Take Your Kids for a Checkup! Summer is almost over! It can be hard to face; the days of lounging in the sun by the pool should never have to end. But, like every year, summer ends, and it is time for school again. When school starts back up, it can be a great time to take inventory for your family of what they need to start off the school year. Thinking about health and staying up to date on check-ups makes sense during this organizational time of year. 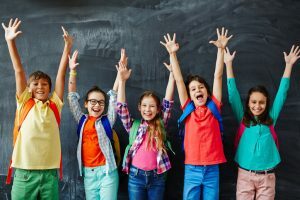 Starting school is a great time to check if your family needs to come in to see your Naperville family dentist for checkups and teeth cleanings. Summer is a busy time but also a time with a lot of fun. It can be easy to forget things like going to the dentist with family vacations, summer camps, and the like going on. We are one of the best dentists in Naperville, providing a variety of services. Along with regular cleanings and check-ups, we can also provide fillings, x-rays, and cosmetic dentistry to Naperville. If you have a teen about to start high school who is thinking a lot about their appearance these days, we also offer Invisalign. This method of braces is transparent and doesn’t involve any metal wires or elastic bands. This can reduce embarrassment for preteens and teens who need braces and is a great option for both teenagers and adults. Our Naperville family dentistry commits to giving each of our patients individualized care that they can rely on. We listen to each one of our patients and what their needs and concerns are, so they know they are getting the best dental care possible. All our staff do everything they can to make sure our office is comfortable and welcoming. We also make an environment that helps put kids at ease, and we will work with them to make their experience at our office a good one. Our friendly front desk staff are happy to schedule you and your family an appointment before school starts. We are also happy to answer any questions you might have about the services we provide and what to expect.